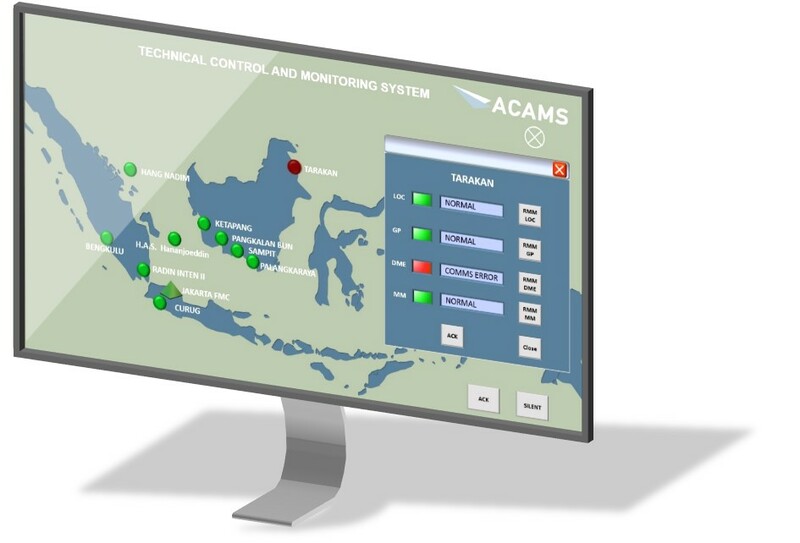 The Technical Control & Monitoring System, TCMS (also known as GAMS or RCMS), gathers status, failure and fault information from the ATC sub systems, performs processing and storage, and displays the information at technical operator workstations at various locations. The system can be applied for local or for regionwide monitoring and control, providing an efficient top-level maintenance management solution, ideal for complex Airport/ATM environments. 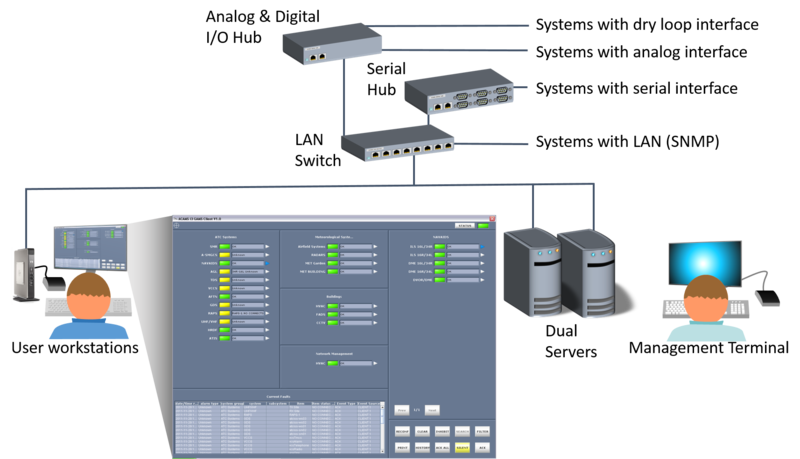 The control of theses subsystems is facilitated from the same work-station and the same HMI, enabling operators to access a wide range of equipment and systems through a single interface. This reduces space in technical room, speeds up handling of alarms and faulty systems and reduce errors. The system interfaces to the external systems using SNMP, Serial Links, Dry Loops and Analogue Inputs as applicable for each system. The interfaces are polled continuously by the GAMS software and the current status stored in the dual servers. Changes in status are time stamped and stored in the database. The current status and logged events are accessible from the client software running on the client workstations. Filtering is included on all dry loop inputs to avoid multiple false alarms. In addition for analogue inputs the threshold levels are configurable. The client software HMI is structured in levels allowing the user to easily view the overall status at the top level and also to be able to extract the detailed information for any sub-system by opening a lower level window. At the top level each sub-system is presented as a single coloured indicator with a supporting text. The GAMS modules send messages to the logging database when there is a status change or new data received. Recent data (for example 30 days) is stored on the dualised server disks. The data can be archived to a NAS system for long term storage and retrieval. The system is made up of COTS components with the main processing performed by maintenance friendly rack servers. Dual servers will poll all the interfaces to the monitored subsystems or handle the interrupts generated by the subsystems based on their built in diagnostic status facilities. The servers will analyse the status information. Without significant delays the servers at all times will provide the data for the comprehensive graphical display of the current operational status of all the monitored subsystems. Clients can access the data and display the status of the monitored systems on a user-friendly HMI. The servers will store the received events as they arrive. The data will be accessed from the clients for display and filtering on the clients’ event log window. At regular intervals the servers will transfer stored data to the Archive System. Operator workstations providing the HMI for the users. Server computers providing centralised processing and data storage. Remote I/O servers for interface to external equipments.